Recent Sales: 48 Bradford Road: 1930's stone Colonial in the heart of Quaker Ridge. 5 bedrooms, 5 and 1/2 bath home features a gourmet kitchen, granite island, new appliances, and breakfast room overlooking large bi-level deck. Huge 26 foot family room, home office, guest bedroom and full bath on first floor. Hardwood floors, two fireplaces, central air. Gorgeous private .43 acre property on very quiet street backing golf course. 10 Seneca: Gracious center hall colonial on a large professionally landscaped property with Sylvan pool and jacuzzi. This spacious, pristine home is perfect for entertaining and outdoor living. Wonderful space and privacy make this an ideal home for all seasons. 93 Sprague Road: First floor with open layout kitchen and dining area, generous living room, denor extra bedroom, and half bath. Second floor: master bedroom with full bath, three additional bedrooms and a full hall bath. Hardwood and tile floors and upgraded windows. 32 Graham Road: Warm Tudor with lovely architectural details and character. Versatile floor plan. Living room with beamed, vaulted, ceilings and stone fireplace. Builder to install kitchen per buyer's selections. Freshly painted. Beautiful oak hardwood floors. 14 Hillview Drive; Custom built home with elegant two story entry. 25 foot formal living room with fireplace and French doors to the deck. Large dining room opens to a stunning, kitchen with vaulted ceilings, Viking appliances, center island, granite counters andhardwood floors. First floor master suite. Ample closets, Marvin windows, high ceilings throughout and an elevator. 38 Park Road: Elegant stone and stucco Tudor with stunning property views from every room. Custom built family room with seating area, soaring ceiling, wrap around sliding glass doors, wet bar, sub zero refrigerator. Modern kitchen with center island and top of the line appliances. Stone terrace. Graceful brass and wrought iron banister flanking staircase. Beautiful master suite, lovely oak floors, arched doorways. Gorgeous 1.36 acres of private and useable property. Wonderful location in the Greenacres estate section. 9 Huntington Avenue: Wonderful Greenacres home with classic appeal and modern amenities. Completely renovated to preserve its classic architectural integrity. Fabulous family room with fireplace, French doors and vaulted ceiling overlooking a beautifully landscaped yard. Hardwood floors and central air. Gourmet eat-in-kitchen with top of the line appliances, granite counters. Large, private master suite with bath. Private backyard, slate patio, specimen plantings. A young couple and their extended family had a surprise encounter with two Scarsdale realtors on Superbowl Sunday, causing the couple to quickly realize they were the victims of a sinister scheme. Realtors Anne Moretti and Janice Rothman had scheduled an open house at 956 Post Road on Sunday to give potential buyers a look at the home. Armed with balloons and open house signs, they pulled up to the house to find a Penske moving truck and a large group of people unloading possessions into the home. Perplexed, Ms. Moretti, the listing agent for the house, asked the family why they were on the premises. To her surprise they claimed that they had rented the home from the owner and were now moving in. Moretti immediately got on the phone to the homeowner, Mr. Johannes Elsevier, who confirmed that the house was not for rent and that he had not entered into a rental agreement with anyone. She summoned the police who arrived to intervene. David Arena, who was in the process of moving into the home explained that he had found the listing for the home on Craig’s List and emailed Thomas Peter who identified himself as the owner. Arena was instructed to wire $3,000, which was the first month’s rent and a security deposit, to Mr. Peter in Logos, Nigeria. When the monies were received he received the house key in the mail. But how did this so called “Mr. Peter” get access to a key? Police questioned Elsevier, who now lives in a nursing home in Mt. Vernon. Elsevier told them that he leaves a house key in the shed on a string so that the cleaning lady and handymen can get in. Sure enough, when Moretti checked the shed she found a string, but no key! Arena’s wife showed police copies of the emails and Western Union wire transfer receipts and the Scarsdale Police instructed them to file a report with the Stamford, Ct. police where they currently live with Arena’s parents. Police will investigate in the hope of recovering the couple’s $3,000 deposit. Moretti has changed the locks on the house and turned on the alarm to prevent any further mishaps. If anyone knows of a reasonably-priced rental available in Scarsdale, please contact the site at scarsdalecomments@gmail.com. Perhaps this heart-broken young couple can move here after all. 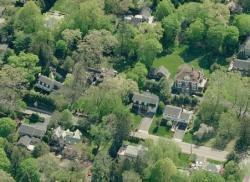 How did sales of Scarsdale real estate in 2009 compare to sales in 2008? Here's a report from Anne Dowd Moretti, Associate Broker at Julia B. Fee. In the Scarsdale school district, 160 single family home were sold in 2009, versus 142 units in 2008, representing an increase of 18 homes sold, or 12.7%. However, the average sales price, declined in 2009, to $1,472,366 from the average sales price in 2008 which was $1,596,343, representing a decline of 7.8% for 2009. As expected, the average days a home was on the market elongated to 184 days in 2009, from 166 in 2008. The total dollar value of all single family home sales in the Scarsdale School District in 2009 was $235,578,517 in comparison to $226,680,649 in 2008. This is not surprising, given the fact that 18 extra homes sold this past year. Looking ahead to 2010, the expectation is that prices will remain somewhat stagnant, but will not erode further, except perhaps for homes in the $2 million plus market. It is interesting to note that sales in the lower end sector, i.e. homes valued at up to $1 million, increased a whopping 52 percent over 2008, as first time home buyers and people who previously looked in other communities found Scarsdale suddenly affordable. The surrounding school districts, including Eastchester, New Rochelle, and even our sister community, Edgemont, suffered significantly more in terms of property values. Scarsdale has been relatively resilient during what has been one of the most significant economic downturns in decades. Our strong schools, combined with our community reputation continues to attract international consumers, as well as locals returning to the community where they grew up! This new mix of customers will benefit from lower interest rates and affordable prices as we gather momentum in 2010. 26 Autenreith Road: Fabulous nearly-new Colonial in prime Fox Meadow location. Amenities include oak floors, three fireplaces, large gourmet kitchen with granite island, breakfast bar and top-of-the-line appliances. Glass doors overlook stone patio & park-like yard. Spectacular master bedroom suite with sitting room, tray ceiling, and luxurious master bath. 176 Clarence Road: Adorable Cape Colonial in lovely Edgewood neighborhood. Perfect starter home with master bedroom on main level. Beautifully landscaped level quarter acre lot offers privacy and tranquil wooded setting. One car detached garage includes extra room with studio. 22 Stonehouse Road: Colonial set on beautiful corner lot on quiet cul de sac in Fox Meadow. Imported marble fireplace and beautiful hardwood floors. Great possibilities. 20 Quentin Road: Well maintained colonial situated on quiet .32 acres. Hardwood floors, new recessed lighting and two zone CAC. . New alarm, new garage walls and garage tech cabinets. New walkway and fence. 70 Greendale Road: Five bedroom, four bath, brick center hall colonial situated on .35 level acres; extensive plantings and mature trees for added privacy. Living room with woodburning fireplace, Cherry wood mantle, den, formal dining room and new kitchen: Silestone countertops. Hardwood floors. Each bedroom with adjoining bath. Sold: 46 Montrose Road: Timeless stone side-hall Colonial on a quiet tree-lined street in Greenacres. Hardwood floors, French doors, wood-burning fireplace, Pella windows and more. Wonderful flow as entry hall leads to living room large enough for a grand piano. Modern eat-in-kitchen with radiant heat floors. Huge attic and ample storage. Lower level playroom/exercise space. Private patio and fully-fenced, flat backyard. 119 Carthage Road: Spacious five bedroom, 3.5 bath home on a quiet street. Featuring an updated kitchen, hardwood floors, a flexible layout, and a lovely family room leading to a brick patio. Deck overlooks a private level property. On the Market: 15 Cooper Road: Unique Victorian Colonial located in the Grange has large rooms: six bedrooms, 3.1 baths, 2 fireplaces and charming center hall with lead windows. Private front patio, set among magnificent trees. 260 Fort Hill Road: Majestic home built in 2005 on 1.5 acres in Edgemont. Two story entry and Turkish stone floor. One-of-a-kind moldings throughout. State-of-the-art kitchen with wet bar and butler’s pantry. Fifty-foot swimming pool. 50 Ogden Road: A blast from the past: 1951 custom built ranch with slate roof and circular driveway in the heart of Fox Meadow. Open floor plan with a large living room with oversized windows and dramatic stone fireplace, dining room, den with custom built-ins and wet-bar, Master bedroom with windows overlooking back yard, bath and second bedroom also with en-suite bathroom. Lower level bedroom and bath, laundry and large two- car attached garage. 968 Post Road: Charming 1921 Colonial set back from street on the Post Road. House sits on one quarter acre with a large, private back yard. Expansive deck directly off the kitchen. 17 Stratton Road: Charming stone front Tudor in Quaker Ridge with curb appeal. Oversized living room with fireplace, den, and elegant dining room. Slate roof, hard wood floors. How Will The Market Fare in 2010?